This one is for you Ed!! 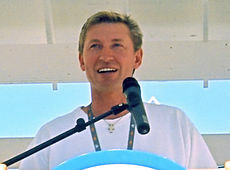 Twenty-five years ago today, the hockey world shook with the news that The Great One, Wayne Gretzky, had been traded from the high-powered Edmonton Oilers to the lowly Los Angeles Kings (sorry Kings fans, but it was true at the time!). It was called a trade, but there is little doubt that Gretzky was sold to the Kings - If you have read Stephen Brunt’s Gretzky’s Tears, you will know what I am talking about - if you have yet to read it, you should! First off, thank goodness we did not have the Internet, Twitter, Facebook, 24-hour sports channels, etc, at the time of the trade. We would have been overwhelmed with non-stop coverage for weeks and/or months. Throughout this week though, and especially today, there has been a great amount of complaining about the coverage the 25th anniversary has received. “It is too much” is the common refrain. Well, if you are a Canadian, and of a certain age (I’m a year away from 40 - yikes! ), it is not too much. The Gretzky trade is my generation’s Armstrong on the Moon or the Henderson goal in ‘72. The news of the deal went beyond the hockey world and shook an entire nation to its core. I was about 14-years old at the time and like folks in ‘72, I can clearly remember where I was and what I was doing that day. Just weeks after his wedding to Janet Jones, Canada’s very own Royal Wedding, the news was announced and Wayne was made out to be the villain in the early days of the trade by the Oilers owner. Canadians wondered how a good, kind-hearted young man from Brantford, Ontario could turn his back on not only his team and his fans, but his Country as well. Hockey fans, not just in Edmonton, openly wept at the news. Canadians asked their Members of Parliament to pass a law banning the deal! The exact details would eventually emerge and we would all become aware of the fact that Wayne was just an actor in the drama cooked up by Pocklington. Cold, hard cash was needed for his other business ventures and Wayne was his greatest asset. It is important to remember the timing of the deal and the year - 1988. It was more than just a hockey transaction for Canadians. In many ways, Canada lost part of its innocence in 1988... The world was changing - the Berlin Wall would soon come down, the USSR would fall too; Canada was searching for its place on the world stage too. Of importance politically in Canada at the time, was the freshly conceived Free Trade Agreement between Canada and the United States. While the politicians cried out that it would usher in a new era of business and opportunities for Canadians, many citizens opposed the agreement. The overwhelming sentiment in my part of the country at that time was that the FTA was simply the first step that would lead to Canada becoming the 51st state of the United States. Real or imagined, the fear was there and so, something as basic as a hockey trade became a question of national identity. So, if you think there is too much coverage of the 25th anniversary, I certainly will not say you are wrong, since we do have the Internet and 24-hour sports channels now. However, keep in mind where this hockey trade hit Canadians the hardest - in their hearts.